Military Families Day, Sunday, May 29, 2011. In honor of Memorial Day Weekend, the Museum remembers those who have served our country by inviting all active or retired military personnel and their families into the Museum as our guests. Military families may enjoy self-guided and audio tours in the Museum throughout the day. Refreshments will be served on the veranda. In addition, at 2 pm the Museum’s Upstairs/ Downstairs at the Tampa Bay Hotel Live Theatre series will feature Richard Harding Davis (1864-1916), the utterly dashing reporter, war correspondent, novelist and playwright, who was an influential taste-maker and opinion-shaper of his day whose prose was read in countless journals and newspapers. In 1898, as American regular volunteers geared up in Tampa for the Spanish American War, Davis stayed at the Tampa Bay Hotel and sailed to Cuba with the first wave of troopships. Those vivid, first-hand dispatches created a national hero-not to mention a future president-in Teddy Roosevelt. Please join us for a very special performance. Henry B. 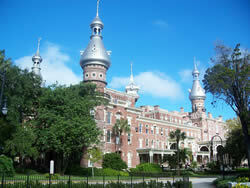 Plant Museum is located next to downtown, on The University of Tampa campus at 401 W. Kennedy Boulevard. Museum hours on Sunday, May 29th are 12-5 pm and Upstairs/Downstairs at the Tampa Bay Hotel at 2:00 pm is in the Music Room, adjacent to the Museum. Active and retired military families receive free admission with i.d. For additional information visit our website at www.plantmuseum.com or call Heather Trubee Brown, Curator of Education at (813) 258-7304 or email her at htrubee@ut.edu. That&apos;s all we got for now folks, but be sure to stay tuned in for more updates on arts and culture in Tampa Bay!